Often, we just wish to go straight into a PES match and ignore all the time consuming tactical adjustment. Perhaps you want a quick match, or your opponent is rushing you to get started. Probably you are already very familiar with your team and see no need to make any changes. But if you only can/ or want to, spare 20 seconds before a match, the most effective knowledge that can aid your game will be Your Opponent’s Game plan. You will gain an advantage even before the ball is played! 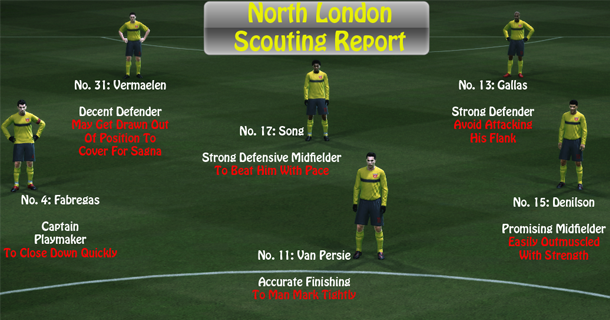 And we can achieve that advantage easily with this PES Scouting Guide. 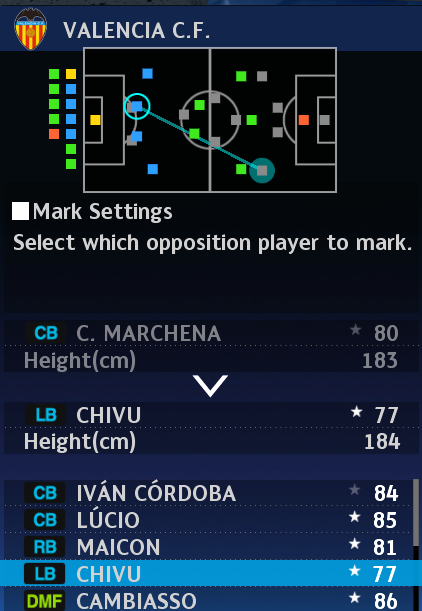 Knowing your PES Opponent’s formation is necessary, but lets take a step further and do some scouting on each of their players. Other than being able to mark their star players, we will also find out where are their weaker links and attack them! We can easily limit their strengths and capitalize on their weaknesses to bring you a step closer to victory. Choose a player and you will have all the information of your opponent. Identify The Hero And The Zero ! Now, lets mark one or two of the better player. Usually, I will mark one of the forward, and one midfielder. Set marking setting to tight. Ensure that your marker’s position is directly opposite the player he is marking. Your LCB should be marking their RCF. Marking the wrong player will result in your marker being pulled out of position. In addition, you may have to alter you marking settings when your opponent makes a substitution, again, to avoid your marker from being dragged out of position and leaving gaps at the back. After identifying the star players, it is time to zoom in on their weaknesses. Scan through the ratings to find the weakest link, and adjust your play accordingly to attack the weak link. We don’t have to mark them, we are just using this option to identify them. Is one of their Centre Defenders big, bulky and slow? Is the other one short? Do they play with attacking Side Backs? Which side back is weaker? Now, if their central defence is short, we play high balls into the box constantly. Keep putting in crosses from the flanks, early crosses, or simply long passes from defence. Field a strong Centre Forward to win them in strength. The defence will panic and make mistakes which you will capitalize on. To counter a strong but slow defence, play ground through balls. Play a fast striker to outpace them. Chivu looks to be uncomfortable at Left Back. In addition, he tends to join in attacks, thus we target him as the weak link. If you find that their Left Back is constantly attacking, push your Right Winger higher and play counter attacks through him! When they play with 5 midfielders, play long ball to evade the crowd. You will be able to create many ways of play to expose the weakness in any PES team, so do a simple scouting before every match! A quick glance at the gameplan gives you all the info you need to defeat your opponents. Thanx again for all the tips for Arsenal team. Now i got one formation which my friend is using. He play with AC MILAN and play with something like 3-3-1-3. I would like to post this formation here and ask you for some advice cos i have always problem with so atacking formation. Haha the AC MILAN line-up is strong! However Arsenal in PES 2009 is not very strong, so it might be tricky haha. If I were you, I would still use 4-4-2. Now, my LB and RB will be marking KAKA and RONALDINHO. And my DM (blob123 suggested SONG) would be marking Pirlo. Whenever they attack down the flanks, get your wingers to drop back to help out. Worse come to worse, hack KAKA and RONALDIHNO down once they get the ball 🙂 Not too near the box though. PIRLO and BECKHAM might pose a threat from long shots. For attack, use your wingers to go wide! Since they only have a 3 man defence, and their midfielders are all congested in the center. Thus i think you avoiding attacking down the center. Play counter-attack! Whenever you win the ball, deliver a high ball to Walcott and charge down the right flank. Maybe you can put him LOW DEFENCE. SS Van Persie on the right side, CF Adebayor on the left side, for both of them to cut in and shoot for the far corner :)Especially VAN PERSIE. And when his defence is too congested, try some random long shots from Fabregas, and a few long balls into the box to pressure him. I hope these helps !